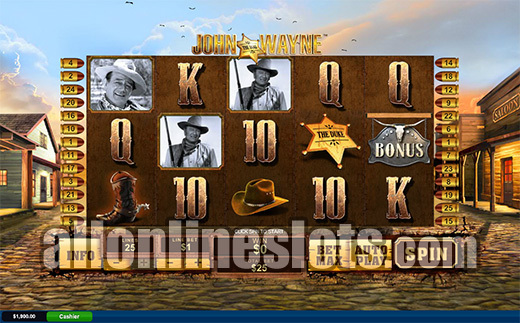 John Wayne from Playtech is the second John Wayne slot machine to be released online. 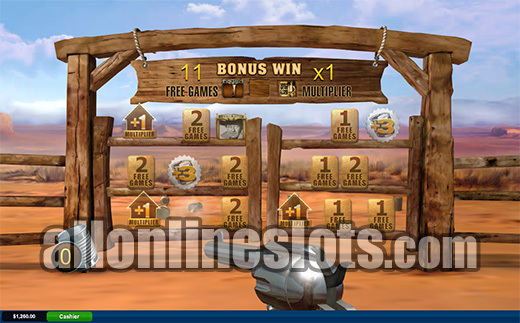 The game has a pick a box bonus as well as a great free spins bonus where you can win extra wilds, extra scatters and big multipliers. John Wayne is one of the worlds most famous actors especially when it comes to the Western genre. 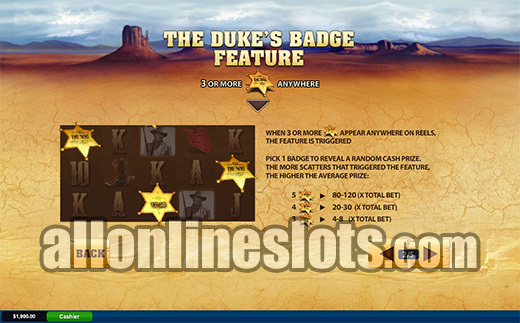 Now Playtech have paid tribute to the Duke with a feature packed video slot. 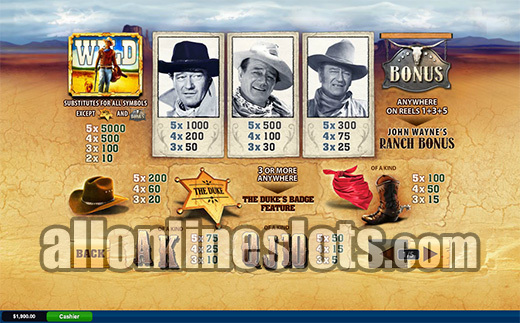 It's not the first time that the Duke has been the theme of a slot machine with WMS Gaming having released their version of John Wayne online in 2012. While both game share the same theme the bonus features, graphics and sounds are completely different. This version has a free spins feature as well as a pick a box bonus compared to the Winning Streak and free spins on the WMS version. 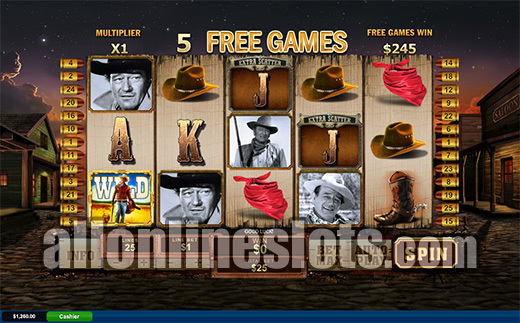 Top jackpot on John Wayne is 5,000 coins for five of the Wild logos on any active line. 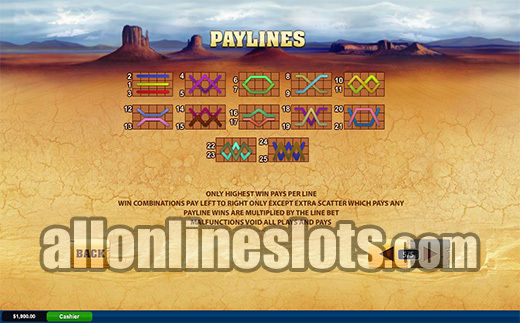 This pays between 50.00 and 250,000 depending on the coin size you choose to play with. The next three highest pays are for the three different John Wayne photos which come in at between 1,000 and 300 coins for five of a kind. 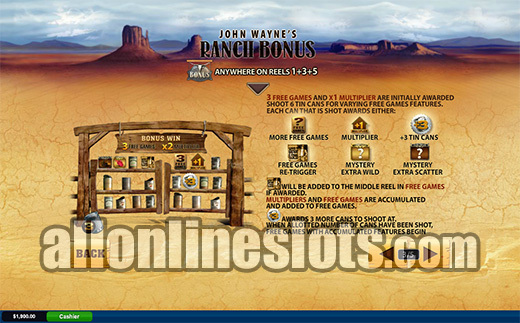 The second bonus on John Wayne is the Ranch Bonus which is won by getting a Bonus symbol anywhere on reels 1 and 5. You then move to the shooting stage where you start with six bullets and a range of targets (Preview). 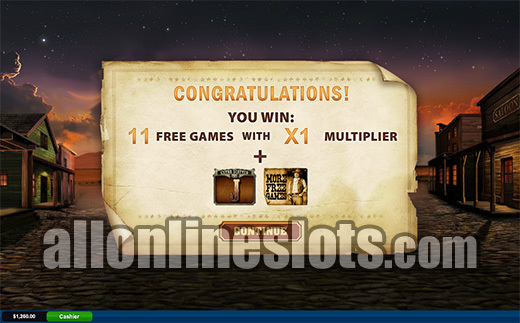 You start off with 3 free spins and a X1 multiplier. Each shot can award extra free spins, extra multipliers, an extra wild, an extra scatter, a re-trigger symbol or more bullets. You get to keep shooting targets until you run out of bullets. 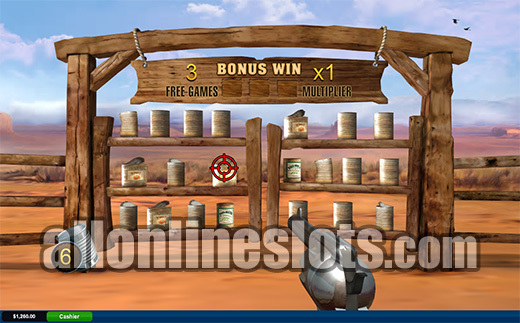 In our opinion the extra scatter is the one you really want to see as wins with this scatter during the free spins are multiplied by your total bet. You can win up to 200X bet per spin with the highest extra scatter. The extra wild comes in handy for getting the top pay and the re-trigger symbol gives you a chance at winning 4 extra games every time it appears. 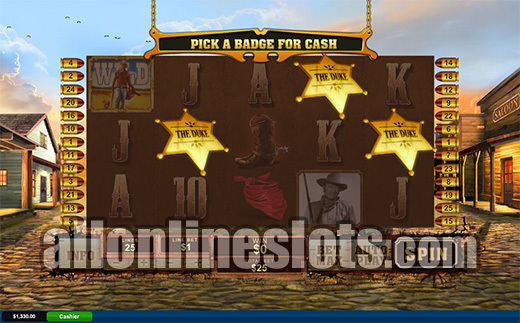 The bonus is very similar to the one found on the highly popular Gladiator slot so if you're a fan of Gladiator then you'll like John Wayne. In our opinion this version is way better than the WMS version in terms of both game play, graphics and jackpots.